Ifeyinwa Frederick writes on why the theatre industry needs a break from its centuries-long love affair with all things Shakespeare. A Midsummer Night’s Dream at Young Vic Theatre. Photo: Tristram Kenton. “Read some Shakespeare. Trust me, study him if you want to understand how to write a play.” I smiled and nodded. Inside I rolled my eyes. I didn’t study him. I didn’t want to because, quite frankly, I couldn’t stand him. I hated Shakespeare. But in recent months, I’ve been interrogating my stance. I loved studying The Merchant of Venice at school, I couldn’t stop praising the recent Donmar Warehouse production of Henry IV and I’m making plans to see Le Gateau Chocolat in Twelfth Night. All this time I’ve been wrong. I don’t hate Shakespeare, I hate London theatre’s obsession with him. There are no records kept on the number of Shakespeare productions put on in London each year nor across how many theatres – a sign perhaps of how little data is kept on London theatre’s ecosystem – but any theatregoer knows it’s a lot. Shakespeare, is by far, the most staged playwright in London. Given that he’s been heralded for centuries as the greatest English writer, I understand his predominance. But to understand is not to agree. And far from championing English theatre, this Shakespeare obsession is to the industry’s detriment. As a new playwright, I’m sure some will view my suggestion as a blasphemous, self-serving desire to do away with the old to make space for the new. However, before I even begun thinking of writing, I was studying Classics at university. As a self-confessed Classics geek, I find it disappointing that although there is an abundance of extant plays from the Classical era, there are only a handful of productions put on each year. If theatres insist on programming Shakespeare because “he’s a classic”, then why not programme more of the most Classical of them all – Euripides, Sophocles, Aeschylus, to name just a few? Only in 2014 did the National Theatre stage its first production in its 50-year history of Euripides’ Medea, yet the theatre has put on over 60 productions of Shakespeare plays. And it’s not alone in this. 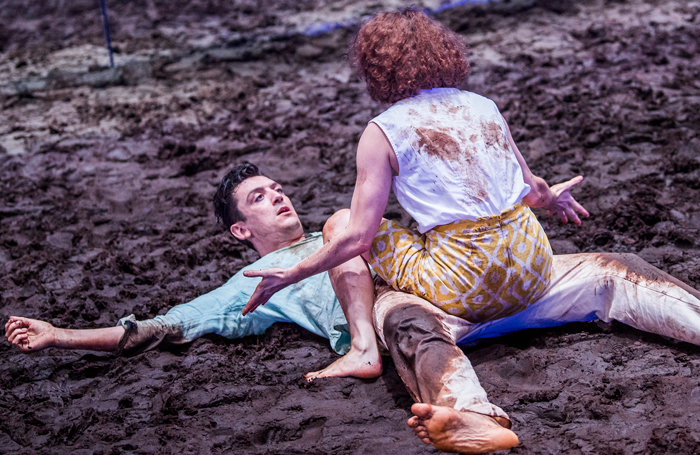 The Classics receive periodic flurries of interest like Almeida’s 2015 Greeks season, but why have they not been allowed to join the regular theatre repertoire like Shakespeare? It’s on the Classical writers’ shoulders that Shakespeare stands – Greek philosopher Aristotle first put forward the three-act structure, and established a set of hugely influential dramatic conventions. And even if I’m alone in my Classical enthusiasm, there are a few centuries worth of plays going backwards from the 20th century that our Shakespeare obsession stops us reviving. If we took a break from Shakespeare, what long-ignored treasures might we uncover? Back in the present, a Shakespeare ban could also give space to the thousands of new writers producing work that is currently being overlooked. Instead of cementing the legacy of one particular playwright, why not nurture a new wave of writers so that in years to come, posterity will be able to speak of a generation of classical writers from this millennium? Perhaps this would stop the purists crying over the “vandalism” of Shakespeare, too – as Michael Billington’s recent Romeo and Juliet review did. Just the other day, I came across a Spectator article entitled “The obsession with diversity in theatre risks spoiling Shakespeare”. I think the author got his words mixed up. The continual staging of Shakespeare’s works risks spoiling theatre, by enabling white men to continue to claim centre stage and contributes to the lack of diversity in theatre. But I do agree with the purists on one thing, let’s stop putting on all-black, all-female and any other forced diverse and modern versions of Shakespeare. Let’s not put him on all together. Like Harriet Walter, I don’t want the only reason I see women in lead roles to be because they’re playing Shakespeare’s male protagonists. Nor do I want the casting of a black performer in a lead role to be seen as a bold statement as so often happens with Shakespeare. I want the kind of diversity I saw in Donmar’s rendition of Henry IV or Black Theatre Live’s production of Hamlet to be the norm. And it is possible. There are playwrights out there writing stories with casts that reflects the world we live in today. If the industry could stop indulging in Shakespeare for a year we could give these voices a chance. Speaking in a post-show Q&A, director Lynette Linton was right; other voices are as valuable as Shakespeare’s. It shouldn’t have to be said, but clearly the industry needs reminding. But “Shakespeare sells”, I hear them cry. Correction: Shakespeare sells more easily. Other theatre sells too. A Shakespeare ban would force theatres to think more creatively on how to sustain audience numbers. If there were an industry-wide effort to promote new works or older plays rarely seen and no Shakespeare was offered as an alternative, the regular-theatre going audience would still buy tickets, and those taking umbrage with the ban could be replaced by those who previously felt alienated or put off by Shakespeare’s presence in theatre. And what perfect timing a Shakespeare ban, would be as the Global Shakespeare project comes to an end this year. The initiative sought to understand Shakespeare’s place in a globalised world and involved working with local theatre practitioners abroad to host performances of the bard’s texts. It has been lauded by Shakespeare enthusiasts, with theatre director Tim Supple advocating that “there are things to gain from seeing how other cultures do the plays”. Now, I agree with Supple that we can “learn from other cultures” but this is not the way to do it. Brits going abroad to stage productions of the most celebrated English writer – is this not just a repackaged form of cultural imperialism? Shakespeare’s prevalence so often feels like a nationalistic indulgence – an opportunity to romanticise the country’s history whether as portrayed by him or the past he represents. Shakespeare’s language – especially in history plays such as Henry IV – has been used for centuries to underpin Britain’s nationalistic sense of superiority. If the industry really wanted to learn from other cultures, instead of going abroad to facilitate performances of Shakespeare, we would do more to invite foreign theatre practitioners to London, and facilitate performances of their country’s classical works in our theatres. Now, The RSC’s Chinese Classical Translation project has made a start and the company is working in collaboration with academics and theatre organisations in the UK and China to create new English translations of classical Chinese works for the UK stage. But the other half of the initiative still involves promoting Shakespeare amongst Chinese audiences with a commission of new translations of his work to be produced in Chinese theatres. With a Shakespeare ban in place, the UK could take a complete break from proclaiming its artistic greatness (we’ll survive, promise! ), and share more of the theatrical greatness of other cultures with us keen theatre-goers. My proposed ban isn’t intended to disparage Shakespeare, but to point out that the theatre world’s love affair with him is nothing short of an obsessive dependency. And like any dependent relationship it is unhealthy, and hindering the development of the dependant. We are suffocating the industry by holding on to Shakespeare so tightly and it’s time for a break. So, let’s have a year-long Shakespeare ban and let’s see how the theatre landscape might flourish in the Bard’s absence.